"Eddie Muller is a very skillful writer and so good at descriptions that, within a few sentences, the characters come to life in front of you." "Muller nails down every corner in this exciting romp, with some scenes that will appeal to hard-boiled fans and others for those who take delight in dizzy doings." "Tough guy writing thrives, as an up-and-coming generation of authors muscles in on the hard-boiled and noir genres and works them into fresh shapes. 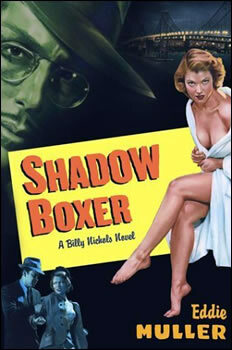 Eddie Muller is one of the smoothest operators of this new crew with his mysteries about boxing reporter Billy Nichols... [In Shadow Boxer] the pace is fast, jazzy, with a touch of pulp..."
The second Billy Nichols novel picks up right where The Distance left off. His lover's dead. 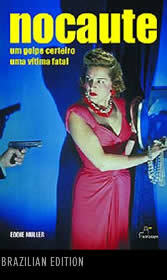 Her killer's caught. Case closed. Guess again. In this highly anticipated follow-up to Eddie Muller's acclaimed debut thriller, sportswriter Billy Nichols discovers that some secrets —like some people—just won't stay buried. In The Distance, readers were plunged into the "gritty authenticity" (Booklist) of San Francisco's boxing culture of the 1940s, as seen through the eyes of the morally complex and charismatic Billy Nichols. Back on the beat, Nichols quickly learns that revelations uncovered in The Distance are only a fraction of a larger conspiracy infecting the Bay City. In Shadow Boxer, Muller proves that when it comes to pitch-perfect noir inflections and top-shelf suspense, nobody does it better. By aiding a beguiling woman, Nichols stumbles on evidence that could exonerate a murder defendant. One problem: the victim was Billy's lover, and he has no intention of setting her killer free. Racing against time, Nichols uproots sinister allegiances stretching from fight clubs to the Hall of Justice to the palaces of Pacific Heights. But is he only a shadow boxer, sparring with phantoms? If he uncovers the truth, will his conscience force him to report it—or destroy it? SAYS EDDIE "I tried to do some things in this book that might be considered subversive for hardboiled crime fiction—you'll have to read it to figure out what that means—but I trust that's not what prompted Scribner to pull the plug on the Billy Nichols series before he even had a chance to get his legs under him. The publisher just didn't get it, and there's nothing you can do about it. But I've been truly gratified to learn how many fans Billy has, and I'm determined to bring him back, with a more supportive publisher."